Canada’s film and television industry is booming and according to a recent report, it’s British Columbia that’s leading the pack. The Canadian Media Producers Association (CMPA) has released its 2018 report on Canada’s Screen-Based Media Production Industry. Findings were mostly positive and show that the sector continues to grow, pushing a new high of $8.92 billion in production across Canada, creating 179,000 full-time jobs and generating $12.8 billion in GDP. “These impressive numbers illustrate that our incredibly skilled workforce, underpinned by strong production infrastructure, have built Canada’s industry into one of the world’s foremost production sectors,” said Reynolds Mastin, President and CEO of the CMPA. 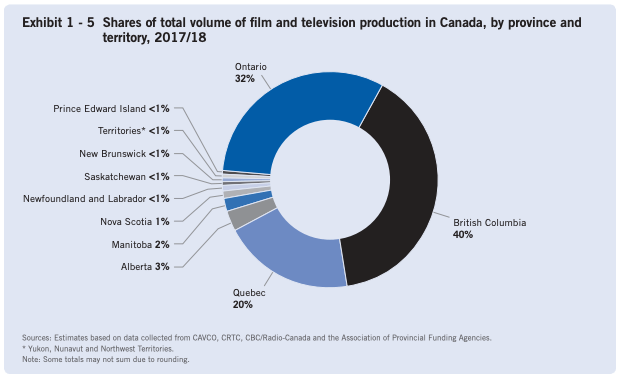 When breaking down total film and television production by province and territory, British Columbia had the highest volume. Between April 1, 2017, to March 31, 2018, BC’s total volume production was $3.58 billion, equating in a 40% share of Canada’s total production. In the process, the province dethroned Ontario, who was Canada’s leader for nine years. Ontario saw a total production volume of $2.89 billion — a 4.9% decrease from 2016-2017. Canada also continues to be a driving force in foreign location and service (FLS) production. Across the country, the total volume of FLS production increased by 26.3%, pushing an all-time high of $4.77 billion over 474 foreign productions. 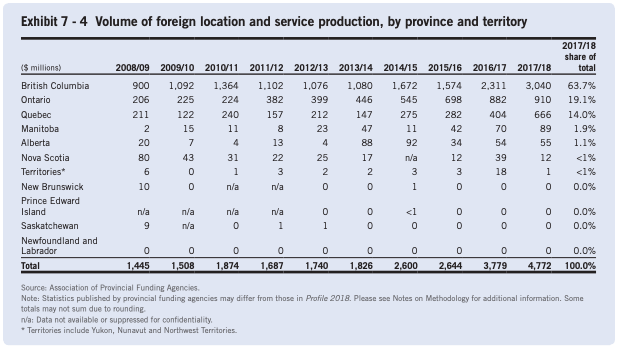 British Columbia accounted for more than half (63.7%) of Canada’s foreign productions and was responsible for a whopping $3.04 billion. Ontario and Quebec, which trailed as the second and third highest-ranked destinations, were far behind, carrying $910 million and $666 million in volume production, respectively. Despite glowing growth in film production, the report also reveals a number of challenges that Canada faces. 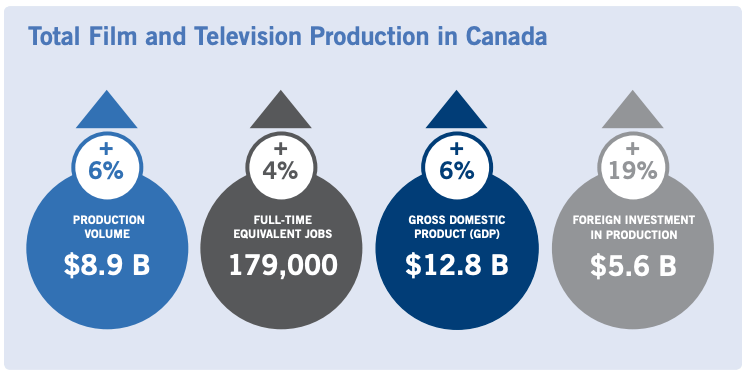 Canadian film and television products dropped by 8.8% and production of broadcaster in-house projects dropped by 15%. “The numbers show there are clouds forming on the horizon, which require attention if we are to strive for a balanced sector,” says President Mastin.